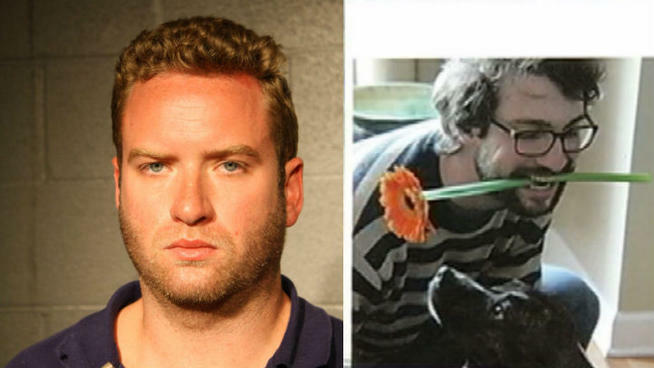 Please note that the time of the arraignment has changed from 9:30 to 9:00 a.m.
Ryne San Hamel, the driver who allegedly struck and killed Chicago bicyclist, Bobby Cann, will be arraigned this Friday, August 2nd. Members of the bicycle community are being strongly encouraged to turn out in a show of support at what will likely be a brief but important hearing. "This is the [hearing] in which a judge will be assigned and a large visible presence of Bobby's supporters will make a strong first impression. If you have not been trained as a [courtroom] advocate you may still appear as a member of the public," said Jason Jenkins, Crash Support Program Manager for the Active Transportation Alliance in a recent post on The Chainlink website. San Hamel was formally indicted on July 16th. At an indictment, a grand jury determines whether enough evidence exists for a defendant to be formally charged with a crime. Guilt or innocent is not determined at an indictment hearing. Generally, at an arraignment the charges are read to the defendant in court who then offers a plea. This Friday's hearing will be the first at which a judge will be assigned to San Hamel's case. The charges against him include, "felony aggravated driving under the influence involving a death and reckless homicide," according to NBC Chicago's website. Allegedly, "San Hamel failed a sobriety test, had an blood alcohol content of .127, and was going 50 mph-- 20 mph over the area's speed limit," the website said. The arraignment will occur at 9:00 a.m. at the Cook County Courthouse at 26th and California, Room 101. Persons interested in attending are encouraged to show up by 8:30 a.m. Cell phones are not permitted inside the building. A 36 year old male cyclist was struck by a minivan and seriously hurt while riding in one of Chicago's new, protected bicycle lanes. The crash occurred on July 10th at around 8:50 a.m. The cyclist was riding his commuter bike eastbound in the 18th Street protected lane when the 23 year old driver of a Toyota minivan passed him in the main traffic lane then suddenly turned right in front of him at Wentworth Avenue. The intersection is uncontrolled. The cyclist could not avoid striking the front passenger side of the vehicle. The crash sent the man hurling over the hood of the van and into the street where he landed on his hands and face. The heavy impact fractured his right arm and wrist, and broke one his front teeth. His arm remains in a cast. Because the break affects his wrist joint he is expected to need extensive physical therapy. He will also need a dental implant to replace his broken tooth. 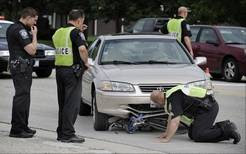 Our law firm has been retained to represent the bicyclist in his claim against the driver. This crash seems to be the result of simple inattention by the driver involved. The bike lane at 18th and Wentworth is protected by thin plastic bollards which warn drivers of the presence of the bike facility, but do not obscure vision into the bike lane. This particular lane is not protected by parked vehicles. Also, the cyclist's route was not controlled by a stop sign or traffic light. He did not anticipate a need to stop. I am often asked whether a driver has to actually strike a cyclist to be held liable for injuries caused in a near miss situation. For example, must a driver compensate a cyclist who successfully evades the motorist's dangerous conduct, whether that be opening a door into the rider's path or passing too closely. The answer is, yes, the driver may be responsible for the harm caused by his or her negligent driving even if there is no actual contact. Why should the driver get a free pass just because the bicyclist took effective evasive action, i.e. by swerving or stopping? However, the lack of contact between car and bicycle can create evidence problems. When there is no contact it may be more challenging to prove that the driver's conduct actually caused the bicyclist's injury. Proving a casual connection between the driver's negligent action and the injury sustained by the cyclist is a vital part of every bicycle injury case. Inevitably the driver will assert that (1) he or she did nothing wrong, and (2) the bicyclist overreacted and crashed on their own. Furthermore, the burden of proving the casual connection between the driver's conduct and the harm is a burden borne by the injury victim. On September 12, 2009, Mr. Parish and a friend were riding their bicycles through Carlyle, Illinois. They were participants in a ride organized by the Trenton Police Department. The route for the ride took Mr. Parish eastbound on Franklin Street through downtown Carlyle. In the area of the accident Franklin street has one lane of travel in each direction with no shoulder or parking on either side. As the two approached 7th Street Mr. Parish heard his friend, who was riding in front, yell, "Truck!" Mr. Parish looked back to see a semi tractor-trailer emblazoned with the familiar "Allied Van Lines" logo bearing down on the two cyclists from behind. The semi did not appear to move over at all to allow space while overtaking the cyclists. Mr. Parish and his fellow cyclist moved as close to the curb as possible. The Allied truck passed them at about 35 mph within 18 inches, in violation of the Illinois 3 foot passing law. Somehow, while the two cyclists were attempting to get out of the way of the passing semi, they ran into one another, causing Mr. Parish to fall and break his leg. Admittedly, there was never any contact between the cyclists and the truck. The truck continued eastbound without stopping. The driver was never identified, and the subject truck was never found. No witnesses were able to obtain a license plate or identifying number from the truck, although Mr. Parish did notice numbers on the door where the truck's DOT number would have been. We brought suit on behalf of Mr. Parish. We filed our case in DuPage County where Allied Van Lines is headquartered. After all evidence had been disclosed and all witness statements had been taken, Allied Van Lines brought a motion to dismiss claiming that they were not liable for Mr. Parish's injuries. In support of their motion Allied pointed out that they did not employ any drivers, nor did they own any trucks. That was true. Allied Van Lines is a sort of umbrella corporation. It contracts with moving companies who own trucks and employ drivers. When Allied contracts with a company they funnel business to the company and they allow the company to use Allied's logo. Illinois law dictates that a commercial truck bearing the logo and US-DOT number of a corporation is operating pursuant to the corporation's authority, and therefore, the corporation is vicariously liable for the driver's negligence. Because of this law, we argued that identification of the driver, ownership of the truck, and actual contact were all irrelevant. We argued that the only relevant question before the court was whether or not there was a question of material fact as to whether or not the subject truck bore the Allied Van Lines logo and US DOT license number. The Court agreed with us and denied Allied's motion. In order to avoid the danger of trying a hit-and-run case without so much as a single witness to refute Mr. Parish's version of the events, Allied agreed to settle the case for $130,000.00. A funeral will be held tomorrow for the 16 year old bicyclist killed by a hit-and-run driver as he rode his bicycle near Charleston, Illinois. Leonard J. Beachy, a member of an Amish community in Flat Rock, Illinois, was struck from behind as he rode with his brothers and two friends on a two-lane road south of Charleston at on July 6th, according to The Southern Illinoisian. The other cyclists were also stuck by the vehicle and were hospitalized . Their conditions have not been reported. The incident occurred at around 9 p.m. on Lincoln Highway Road as Leonard, his brothers, Jonathan Beachy and Truman Beachy, and his friends, Timothy Zehr and Javin Lehman, were riding southbound back from an Amish farm-trade show, according to WRJM Daily News.com. Shortly after midnight on July 7th police arrested the owner of the vehicle that allegedly struck the cyclists, Samuel Meadows. He has been charged with aggravated driving under the influence and leaving the scene of a personal injury/fatal accident. Leonard Beachy's funeral will be at 9 a.m. tomorrow at the home of David Raber of Flat Rock, Illinois. Burial will be in the Flat Rock Amish Cemetery, Flat Rock, Illinois. Leonard was an apprentice cabinetmaker and carpenter at Peaceful Valley Cabinetry in Flat Rock. Click here to learn more about the funeral services.